Popiah is a Fujian/Chaozhou-style fresh spring roll common in Taiwan, Singapore, Malaysia and Burma/Myanmar, where it is called kawpyan. 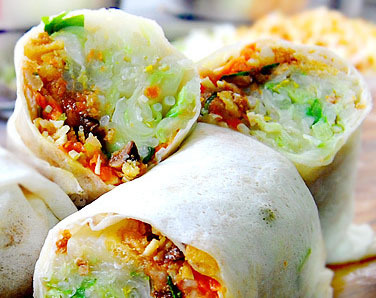 Popiah is often eaten in the Fujian province of China (usually in Xiamen) and its neighbouring Chaoshan on the Qingming Festival. 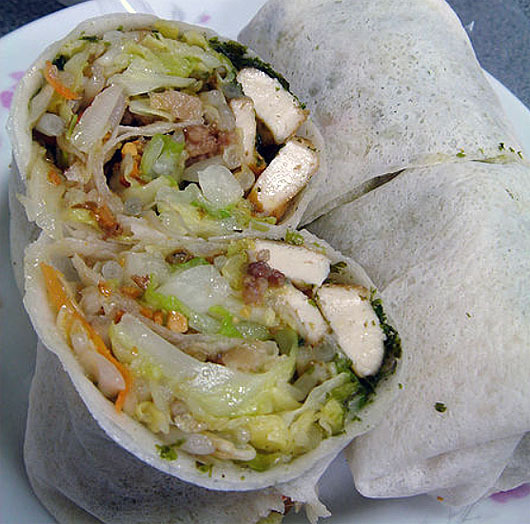 In the Teochew (Chaozhou) dialect, popiah is pronounced as "Bo-BEE-a"(薄餅仔), which means "thin wafer" . In Thailand, no doubt influenced by its large Teochew Overseas Chinese community, the spring rolls are called "Bpaw! Bee Uh". 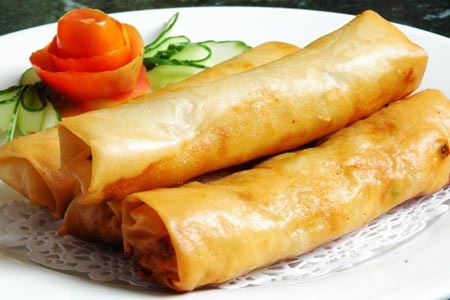 In variants of the Hokkien dialect, it is also commonly referred to as "lun-BEE-a"(潤餅仔), which probably explains why the spring rolls are referred to as "lumpia" in the Philippines. It is sometimes referred to as runbing (潤餅) or baobing (薄餅) in M​​andarin, and also as bópíjuǎn (薄皮卷). In Taiwan, popiah are eaten in several varieties. They can be classified into fried and non-fried versions. The fried version is very commonly served year-round in Chinese restaurants. It is small, crispy and rolled with meat or sweet red bean paste.The non-fried version is much more complicated and is called runbing (潤餅) in M​​andarin (still (薄餅) in Taiwanese). There are two kinds of skins which roll the stuffing: one that is slowly heated until cooked is famous for being very thin; the other is baked. Furthermore, the way of cooking the stuffing is very different as well. In northern Taiwan, the stuffing is flavored, stir-fired, sometimes it goes with peanut powder, and the sauce is salty . In southern Taiwan, the popiah stuffing is water blanched without additional seasoning, and flavoured primarily with sugar and peanut powder. 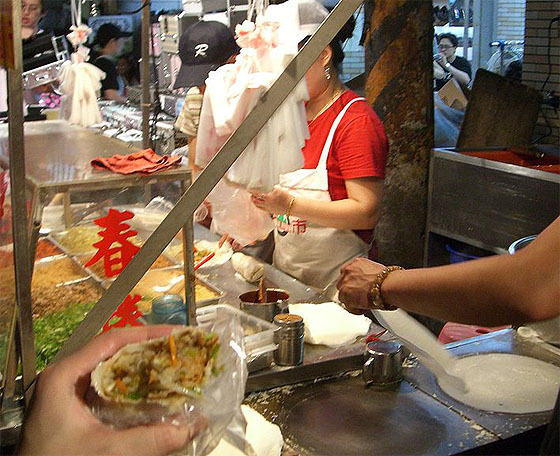 For people who live in southern Taiwan, the addition of sufficient sugar is key for popiah. 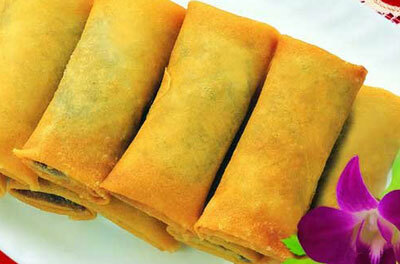 Moreover, some people like to heat or steam the spring roll again after it is made. The stuffing itself is quite diverse among different places. The basic stuffing includes vegetables, meat and thinly shredded omelet. In some places, they also add noodles, Chinese sausages, stewed vegetables instead of blanched ones, tofu, seafood, sticky rice, and so on. 台灣小吃 基隆潤餅 A popiah vendor in Keelung, Taiwan. 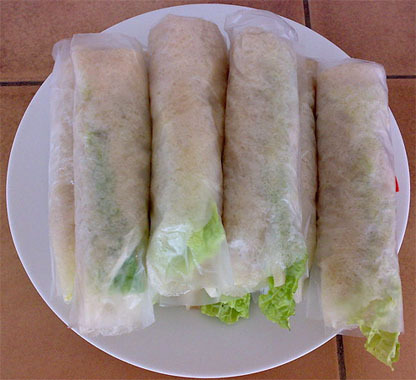 Popiah crepes are produced through rubbing a dough and then filled and rolled.